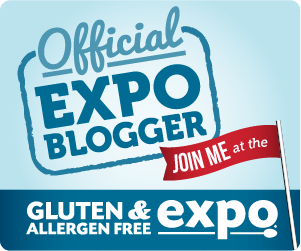 Guess who is an "official" blogger for the Gluten and Allergy-Free Expo in Dallas this October! This Mama! The classes are free to attend with your admission, and include topics from the Top Things to Know When Going Gluten-Free and Overcoming Obstacles to How to Safely Eat Out and Travel and info on supplements, enzymes, and natural solutions. While at the Expo, in between cadging all the free samples I can and shmoozing with the vendors... I mean "attending informational classes," I'll be sharing updates on Facebook and Twitter, and photos on Instagram - what's happening, who's there, and my favorite new finds! I am excited to be going for several reasons. (And a 2-night vacation away from my kids isn't even the top one!) I am always on the lookout for allergy-safe products, both for my family and our food restrictions, but also to accommodate our nut-free schools, and in case of food allergies in a classroom. I refuse to bring snacks that everyone can't enjoy. And getting the opportunity to sample and try stuff out first is just icing on the (gluten-free dye-free) cake! The classes being offered look very interesting as well - it will be hard choosing which ones to go to in each time slot! As an added bonus, I'll get to meet my online-friend Rebecca from Bentos on the Bayou in person! Squeee! If you don't happen to live in the Dallas area, and don't feel it's worth a trip just to see yours truly, this event happens several times per year, in different areas around the US! Join Me October 26-27, 2013, either in-person in Dallas or live vicariously through my social media updates! General Admission is $20 for adults and $5 for kids, either day, or $30 for both days! If you're just going one day, beat the crowds and get a whole extra hour with Early Admission ($35 adults, $10 kids.) Limited to 400 tickets, versus the several thousand people you'll be competing with for free samples the rest of the day! Follow GFAF Expo on Twitter and Facebook for updates on Dallas and the other GFAF Expo events, schedules, and vendor info! So jealous! I wish I was going, but Im glad you and Rebecca get to meet up!